Hasdrubal the Fair (Punic: 𐤏𐤆𐤓‬‬𐤁‬𐤏𐤋‬, ʿAzrubaʿal; c. 270–221 BC) was a Carthaginian military leader and politician, governor in Iberia after Hamilcar Barca's death, and founder of Cartagena. Livy's History of Rome records he was the brother-in-law of the Carthaginian leader Hannibal and son-in-law of Hamilcar Barca. Hasdrubal followed Hamilcar in his campaign against the governing aristocracy at Carthage at the close of the First Punic War, and in his subsequent career of conquest in Hispania. In 237 BC, they parted towards the Peninsula, but around 231–230 BC Hasdrubal allegedly interceded in Hamilcar's name making the Numidian tribes from Northern Africa submit to the Barcid family; from there,[clarification needed] Numidia fell into Carthage's sphere of influence. 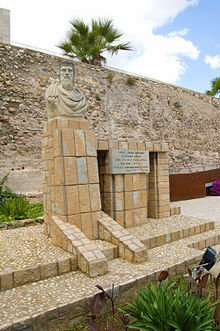 Thus, he extended the newly acquired empire by skillful diplomacy, consolidating it by founding the important city and naval base of Qart Hadasht, which the Romans later called Carthago Nova (Cartagena) as the capital of the new province, and by establishing a treaty with the Roman Republic which fixed the River Ebro (the classical Iberus) as the boundary between the two powers. This treaty was caused because a Greek colony, Ampurias, and also Iberian Sagunto, fearful of the continuous growth of Punic power in Iberia, asked Rome for help. Hasdrubal accepted reluctantly, as Punic dominion in Iberia was not yet sufficiently established to jeopardise its future expansion in a premature conflict. Seven years after Hamilcar's death, Hasdrubal the Fair was assassinated in 221 BC by a slave of the Celtic king Tagus, who thus avenged the death of his own master. Hasdrubal's successor was his brother-in-law and the son of Hamilcar, Hannibal Barca. ^ Huss (1985), p. 566. ^ "Hasdrubal – MSN Encarta". Archived from the original on 2009-11-01. ^ Polybius 3.7–16, Livy 21.22.1–4, Livy 23.26.2, Diodorus of Sicily 25.2 :Hasdrubal, son of Hamilcar, was sent by his father-in-law to Carthage against the Numidians, who had rebelled against Carthaginians, killing eight thousand in combat and taking two thousand prisoners. The rest were submitted to tribute. ^ Diodorus, 25. 10. In the course of his flight Hamilcar contrived to save the lives of his sons and his friends by turning aside on another road; overtaken by the king, he plunged on horseback into a large river and perished in the flood under his steed, but his sons Hannibal and Hasdrubal made their way safely to Akra Leuke. ^ Livy 21.2.7 He augmented Carthaginian dominion promoting hospitality bonds with lesser kings and leaders, attracting new nations by noblemen friendships, and not by war and weapons. Appian: Roman History. Biblioteca Clásica Gredos 84 (in Spanish). Polybius: Histories. Biblioteca Clásica Gredos 38 y 43 (in Spanish). Titus Livius: History of Rome. Libro de Bolsillo Alianza Editorial 1595 1–2 (in Spanish).